Complete catalogs in e-book form. Each catalog is one exe file. Click on it and it turns into a book. E-books are a marvelous way to preserve and share glass information. Some of these catalogs contain many pages and will require either a fast connection or a great deal of time. Email me at Donna@carnivalheaven.com if you would like a CD containing all the catalogs listed below. Sorry, I can no longer ship internationally. A one time donation of 10.00 or more is required in order to download catalogs. Scanning these catalogs and making them into ebook form takes a great deal of time and downloading them uses site resources (bandwidth) which we have to pay for. Right now, payment is on the honor system. If no one pays, I will have to password protect this part of the site. 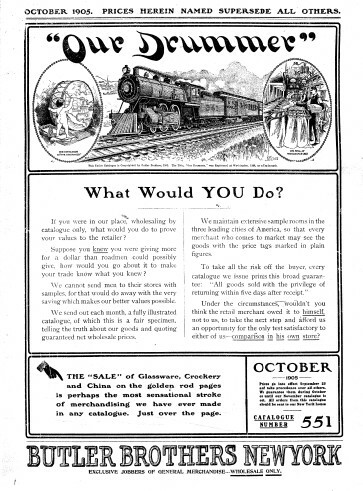 Your 10.00 or more donation entitles you to download any or all of the catalogs and any future catalogs. 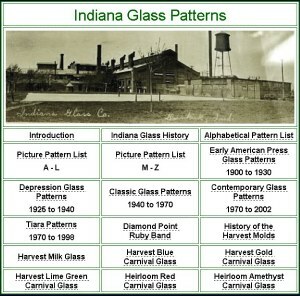 Contains about 200 Indiana Glass Patterns, EAPG, Depression Glass, Classic Glass, Contemporary Glass, Tiara and more in easy to use, ebook form. 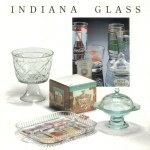 Contains ALL the Harvest carnival and milk glass, items, ALL the Heirloom items, ALL the Diamond Point catalog info. This can't be downloaded, too big. There are over 50 MB's of info and about 2000 pictures, MASSIVE amount of info. Click on the picture to the left, for more info or below to purchase the CD. These catalogs pages represent a labor of love. 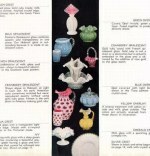 These pages contain the original ads for 266 carnival glass patterns. These precious pages were compiled by Dean and Diane Fry in 1994. Only 250 copies were made. Now, due to digital technology, these pages can belong to all who love carnival glass. Download and enjoy! I NO LONGER SHIP INTERNATIONALLY. THE SHIPPING RATES HAVE TRIPLED IN THE LAST YEAR OR SO. USA SALES ONLY UNLESS PRIOR ARRANGEMENTS HAVE BEEN MADE. If you would like to send a check or money order, please email me and I will send you my address. E-books are the wave of the future. The world libraries are working with Google to create a Virtual Library. Libraries all around the world are scanning books and turning them into this e-book form. It is a BIG project that will take years, but when completed, you will be able to download all kinds of books in this same e-book form. There will be a VAST world of books available with just a few clicks of your computer. One librairian was asked if she felt threatened by a virtual library. Did she feel that it would put regular libraries out of business? She answered an astounding NO! She said that MANY felt that TV would "kill" radio but instead they evolved to enhance and compliment each other. Printed books and e-books will do the same, enhance and compliment one another. Publishing costs are HIGH. We all know how much printing ink costs............. Would not surprise me a bit if more and more future authors choose to self publish in this e-book form. E-books are printable if you care to make your own hard copy.